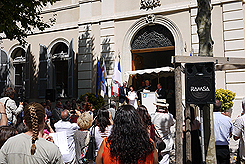 The opening of the 22nd International Biennale of Contemporary Porcelain in Vallauris on 7 July 2012 was celebrated in one of the city’s public squares under a bright Mediterranean sky. A festive air was lent to the occasion by it being the beginning of the school summer holidays, so it was well attended by ceramic artists from Vallauris and the surrounding area, people involved with the exhibition, and a large number of locals and tourists of all ages. Salle Eden, a building facing onto the square, was home to the special feature country exhibition, Arts of Fire, Transformation of Space: Masterworks of Contemporary Japanese Porcelain, coordinated by Professor Nicole Coolidge Rousmaniere and organised in association with the Sainsbury Institute for the Study of Japanese Arts and Cultures. Once inside Salle Eden, visitors encountered seven plinth islands jutting from the floor in a space enclosed on all sides by grey walls. Each island revealed a unique world created by the work of one artist. 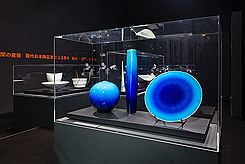 Thus while the pieces shared a common grounding in the Japanese ceramic art tradition, their particular manufacture and singular beauty was manifest in entirely different ways. Disparate forms on neighbouring islands found cohesion in the shared environment and thereby, as evoked by the title of the exhibition, created a ‘transformation of space’. 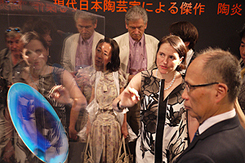 The originality of both the individual works of art and their display was fascinating and inspiring, as shown by the numerous questions from the audience when Mr Nagae Shigekazu, an artist who travelled from Japan to France for the opening ceremony, gave a speech about his work. The enthusiasm for Mr Nagae’s ceramics was consolidated by a workshop that he ran from 9 to 12 July. I joined as the interpreter and right from the start I could feel a sense of solidarity between everyone who took part, based on a shared passion for porcelain. In fact, seeing how quickly Mr Nagae and the participants developed a mutual understanding that transcended language, I even wondered whether my role was truly necessary. The participants were all engaged in one aspect or another of porcelain making and included artisan ceramicists, sculptural ceramicists and artists of contemporary ceramics. Some came from Vallauris or Marseille while others had travelled from as far as Korea and Argentina. The diverse nature of the group made for a dynamic, spirited event where animated discussion sometimes took the workshop in unexpected directions and where the objects made by the participants were enormously varied. Even after the workshop had officially ended, people stayed in the studio to continue experimenting with the techniques they had learned from Mr Nagae. Here once again I saw how ideas presented by an established artist can instigate highly creative responses and thus with my own eyes witnessed the emergence of a new ‘space’. Personally, I was particularly struck by Mr Nagae’s description of the circumstances that led him to produce his signature forms. Porcelain is easily deformed when heated at high temperature, so in general manufacturers try to avoid such deformation during firing in order to create perfectly beautiful shapes. However Mr Nagae decided to take the opposite approach, to turn this weakness to his advantage by making delicate white porcelain pieces with elegant arching contours, as if they were constructed of folded paper, or origami. The workshop participants, including myself, were touched by the way in which Mr Nagae’s attitude matched the flexibility of both his creativity and the materials he used.